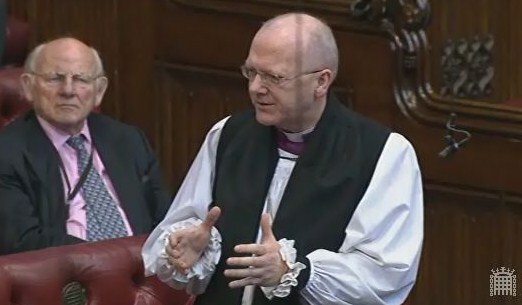 On 10th March 2015 the Bishop of St Albans, Rt Rev Alan Smith, asked a question in the House of Lords on humanitarian assistance for the people of Tikrit, Iraq. He followed it with a supplementary question to the Minister. Those exchanges, along with a transcript of all subsequent questions on the same by Peers, are below. The Lord Bishop of St Albans: To ask Her Majesty’s Government, in the light of the statement by the United Nations that 28,000 civilians have been displaced from the city of Tikrit by the actions of Islamic State, what plans they have to increase the provision of humanitarian aid to the conflict area. Lord Bourne of Aberystwyth (Con): My Lords, to date the United Kingdom has committed £39.5 million to the crisis in Iraq. The Government of Iraq, supported by the United Nations, are leading the humanitarian response for displaced civilians from Tikrit and have scaled up their operations accordingly. DfID staff in-country, in close communication with their international partners, are monitoring the situation closely. The Lord Bishop of St Albans: I thank the Minister for his reply and for all that the Government are already doing, which is very commendable. Having said that, I believe that some of our humanitarian responses to other armed conflicts have shown that sometimes the response has been too little, too late. As the UN is estimating that there could be as many as 1.5 million people displaced by the battles for the liberation of Tikrit and Mosul, what discussions are Her Majesty’s Government having with our allies so we can get a step change and get preparations put in place for what looks like a very deeply worrying humanitarian crisis about to happen in front of our eyes? Lord Bourne of Aberystwyth: I thank the right reverend Prelate for his kind comments. An interagency needs assessment has already started—it started yesterday—being led by the UN. Initial estimates suggest that up to 4,000 newly displaced families are in urgent need of humanitarian assistance. The United Nations, through Lise Grande, the co-ordinator for Iraq, has fast-tracked a strategic response plan, which is committed to $150 million-worth of aid. We are hoping for continued discussions in the fringes of the World Bank meeting in April, once there is a clearer assessment of what the needs are. Baroness Nicholson of Winterbourne (LD): Does the Minister agree that the security situation in Tikrit and the surrounding regions, getting close to Mosul, is one of outstanding difficulty in allowing either United Nations agencies or the international NGOs that DfID funds to work at all? I was in fact in that region last week, as the Minister may know. Will Her Majesty’s Government consider looking at the small, specialist agencies, some of which are Iraqi, that can and do work there? I chair one myself—the AMAR International Charitable Foundation. These agencies are there, they are on the ground; they are where the international agencies cannot go in safety and, therefore, do not allow their teams to go; and yet there is no access to international funding for these agencies. Does the Minister have any thoughts as to how this situation could be corrected? Lord Bourne of Aberystwyth: I thank my noble friend for her efforts in Iraq, of which I was well aware. It is true to say that the UN is leading in terms of the humanitarian crisis in Iraq, and the small agencies are certainly a part of that. The security situation is very sensitive, but those working there—and I pay tribute to them—are well aware of the concerns. There is evidence that the aid that is being processed and going through to Iraq is reaching the people that it needs to reach. Lord Collins of Highbury (Lab): My Lords, we also have to focus on the host nations that are dealing with this refugee crisis, particularly in the region as a whole. Can the noble Lord tell us what steps are being taken to ensure that the infrastructure of those countries does not collapse under the burden? What discussions has he been having in particular with Turkey? Lord Bourne of Aberystwyth: The noble Lord is right: the surrounding countries are also clearly of importance. He will be aware that Her Majesty’s Government have committed £800 million to Syria and the surrounding countries—to Jordan, Lebanon and so on. Turkey is a key partner in the efforts and the Prime Minister has spoken to Turkey about related issues—the noble Lord will be well aware of the school children from Bethnal Green, for example, going out to join up with ISIL—so there is an existing infrastructure of communication there. We are well aware of the need to ensure that the region as a whole is taken care of in terms of security and humanitarian aid. Anybody who looks at DfID’s record will be well aware of that. The Secretary of State visited Iraq just last year. Lord Avebury (LD): My Lords, will my noble friend say anything about the co-ordination of our humanitarian operations in the region with those of the Iranians, who are leading the offensive against IS in Tikrit and Mosul? Lord Bourne of Aberystwyth: My noble friend is absolutely right that the Government of Iraq are key to all of this. With Prime Minister Abadi, the early signs are that they are doing a very good job. They are an inclusive Government. We are committed to ensuring that there is a united Iraq again at the end of this humanitarian crisis. Meanwhile, we are working with the Government of Iraq, the United Nations and other partners to ensure that humanitarian aid and military action, if necessary, are properly co-ordinated. Lord Campbell-Savours (Lab): My Lords, in so far as Tikrit is a Sunni community and the Daesh is a Sunni movement persecuting its own Sunni community, and if we are engaged in providing assistance, can we use those routes for providing assistance to develop a new relationship with the Sunni leadership in Iraq, who very often have been ignored? Lord Bourne of Aberystwyth: My Lords, the noble Lord is right: it is basically a Sunni community. It was, of course, the birthplace of Saddam Hussein and therefore has a totemic significance as well. We are aware of that. The humanitarian aid that goes from this country is given on the basis of need; it is given without any consideration of which community or religion a person comes from. But we are seeking to ensure through Prime Minister Abadi—who, of course, is Shia—that there is a united Iraq at the end of all of this, encompassing all faiths. Lord Howell of Guildford (Con): My Lords, I think that the noble Lord, Lord Avebury, asked about the operations of Iran in Iraq at the moment, in Mosul and Tikrit. Does the Minister have any information on that issue? Lord Bourne of Aberystwyth: My noble friend will be aware that Iran is not a partner of the UK in this although it is an important player. It is true that it is involved in this, but I have no direct reference to what is happening via Iran as it is not a partner of the United Kingdom.